The Uruguay Flag features nine alternating horizontal stripes in the colors of white and blue. In the top left-hand corner of the flag is a square that features the 16-ray sun, the "Sun of May." The white color of the flag represents peace and honesty, and the blue color of the flag represents the sky and water as well as truth and loyalty. The colors of the Uruguay Flag were taken from the Argentina Flag. The sun on the flag represents "Inti" the Sun God of the Inca Region and it has been a national symbol since the 19th century. 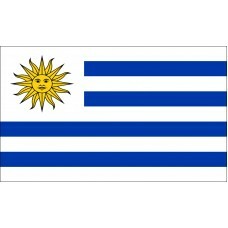 The sun also represents freedom and independence of Uruguay and symbolizes the May revolution of 1810. The Uruguay Flag was first adopted on December 16th, 1828 and featured 19 stripes until it was changed to the current one that was adopted on July 11th, 1830 which features 9 stripes to represent the nine departments of Uruguay, which are, Montevideo, Maldonado, Canelones, San Jose, Colonia, Soriano, Paysandu, Durazno, and Cerro Largo. The flag of Uruguay was designed by Joaquin Suarez, who went on to become the president. Uruguay is the second smallest country in South America (following Suriname) and shares borders with Brazil and Argentina. The official name of the country is the "Oriental Republic of Uruguay." The largest and capital city is called Montevideo. Uruguay was named after the "Rio Uruguay" (Uruguay River) and translates as "River of Birds." The first people to inhabit Uruguay were known as the "Charrua" who were nomadic people that lived in tents. They were the only inhabitants until the Europeans began to arrive to the country in 1516. In the years that followed, there was much conflict and battle between the Spanish (who took Argentina) and the Portuguese (who took Brazil), who were both trying to claim Uruguay (formerly known as "Banda Oriental"). This was mainly due to its geographical position, as it was close to the mouth of the Rio De La Plata which is an estuary (where the river meets the sea) formed from the Uruguay River and the Parana River which border both Argentina and Uruguay. The first permanent settlement was established by the Spanish in 1624 at Soriano. In 1680, the Portuguese built a fort at Colonial Sacramento which was directly opposite Buenos Aires. In 1776, Uruguay (Banda Oriental) became part of the vice-royalty of La Plata, of which Buenos Aires was the capital. In 1811, Jose Gervasio Artigas (known as the "father of the independence") began a revolt against the Spanish and proclaimed independence from them in 1815. In 1817, the Portuguese forces invaded and occupied Montevideo until all of Banda Oriental became part of Brazil until it gained full independence (with the help of the Argentinians) following the Treaty of Montevideo in 1828. Uruguay is a popular tourist destination and is considered to be home to some of the best beaches in South America. Orientals, our nation or the grave, Liberty or with glory we die. Its the vows that our souls pronounce and which heroically we will fulfill. We will fulfill. We will fulfill. We will fulfill. This Holy gift of Glory we deserved Tyrants: Tremble ! Liberty in combat we will Cry Out! And even dying, Freedom we shall also Shout !